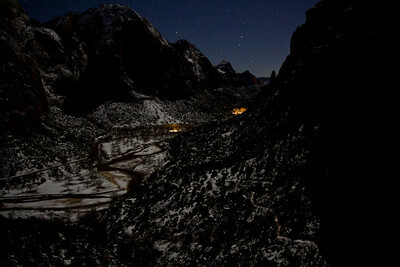 Matt Holland Photography: Starting 2011 off the right way! With Minnesota covered in snow and too cold to properly work a camera's controls, I decided to head south and see if the "snowbirds" maybe had the right idea after all. 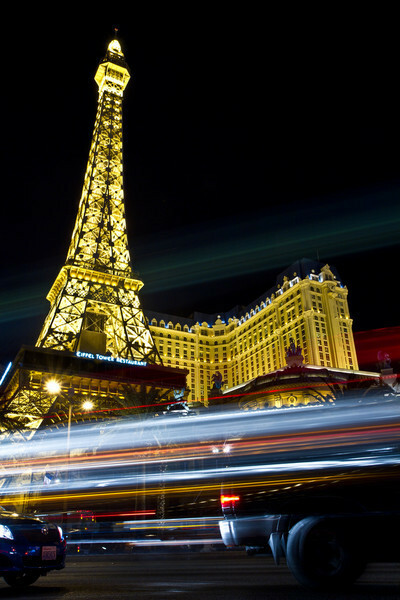 I worked in Las Vegas at CES 2011, so I added a couple days to my trip so I'd have time to visit Zion National Park and some other scenic spots in Nevada, Utah, and Arizona. Las Vegas certainly had glitz, but after four days on the show floor at CES I was quite ready to get out of town. The first stop was Valley of Fire State Park, about 40 minutes east of Vegas. This was Nevada's first ever state park, and was quite beautiful! The amazing rock formations are just awesome shades of red and orange, and are carved into all sorts of nooks and crannies by the wind. 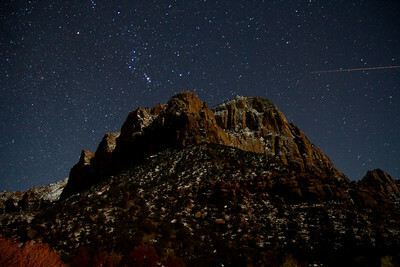 I didn't have too much time here though, because I was still several hours from Zion National Park, and wanted to have time to climb Angels Landing that evening! I arrived at the park about four hours from sundown, and started the ~1500 foot ascent up a seeminly neverending series of switchbacks known as Wally's Wiggles. The backpack full of gear and cameras started to seem like a poor choice after only a mile or so, but I pressed on. A half mile from the summit, signs warned of extreme danger in darkness, thunderstorms, or ice and snow conditions. What's an adventure without a little danger? I made it to the top in time to relax and watch the aftermath of the sunset at the end of the canyon, which was definitely worth the effort. Of course, watching the sunset from the summit meant I now had the distinct priveledge of climbing back down in the dark. I was able to make it off the ridge and back to the switchbacks before it got really dark. The view of the valley from the trail was truly breathtaking. After turning off my headlamp and giving my eyes time to adjust, the moonlit canyon was laid out before me under the most stars I'd ever seen in my life. Taking some photos also allowed for a much needed break from walking! 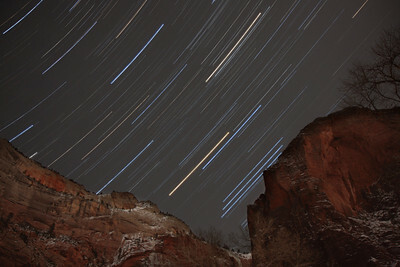 Next on my agenda was star trails, so I bundled up and set up the tripod for almost three hours, compositing almost 1,000 frames to create the image and video below. Light clouds had blown in by then, which wasn't perfect, but the view was still spectacular! I had a bit of a drive planned the next day, so I couldn't keep at it too much longer, and the cold was murder on camera batteries, so I snapped a couple more before calling it a night. The streak at the right of the photo below is most likely an airliner headed for Las Vegas. 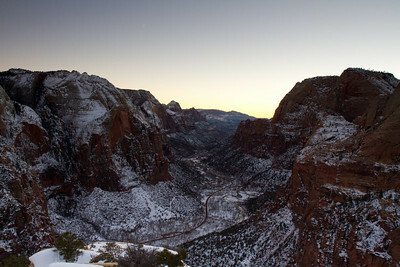 The next day I headed to Arizona, by way of the Zion National Park Scenic Drive. Hairpin turn after hairpin turn on ice in a FWD rental. Exhilarating! 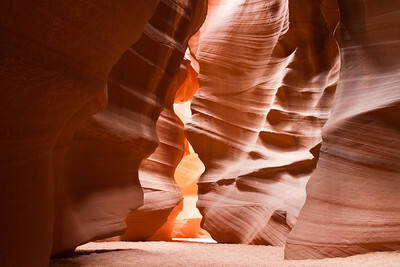 My destination was one of the most-photographed canyons in the world, Antelope Canyon in Page, AZ. 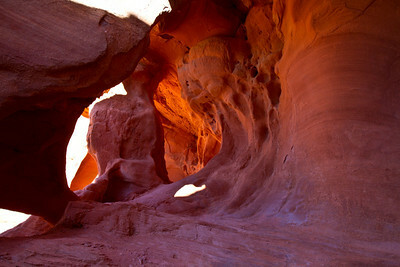 Since Antelope Canyon is a sacred Navajo place, I hooked up with a local guide and headed to upper Antelope Canyon. All I can say is, if you ever have the chance to visit, do it! During the warmer months the canyon is typically choked by tourists, but the upside of the ~30 degree weather was that I had the place to myself! I was also able to visit Rattlesnake Canyon, another nearby slot canyon that is less popular, mostly due to its extreme narrowness in some places. After my visit to Antelope Canyon and the Navajo Nation, I turned west to return to Las Vegas to catch a jet home. I wish I'd had more time to visit some of the other nearby parks and monuments (Glen Canyon, Hoover Dam, the Grand Canyon, Grand Basin, etc), but it couldn't last forever! All in all, this trip was a fantastic photographic start to 2011!